Among the traders there have long been known fixed rules, which all traders try to understand at the beginning of their online trading. Yes. We all know that "trends are traders' friends". And we all know that the opening of an order is in accordance with the direction of the main movement, that is the tendency, giving the possibility of the order being done correctly. It is better to use this possibility, because the risk of the return movement is smaller than the possibility of the direction of movement, namely the tendency. While the possibility for a significant change in tendency becomes even less. Thus, determining trend movements is the main purpose of the trader. In that case, traders usually use many technical analysis instruments. The crocodile indicator is one such indicator. This instrument was invented by Bill Williams. This indicator works the tendency correctly and permanently. The principle is simple. 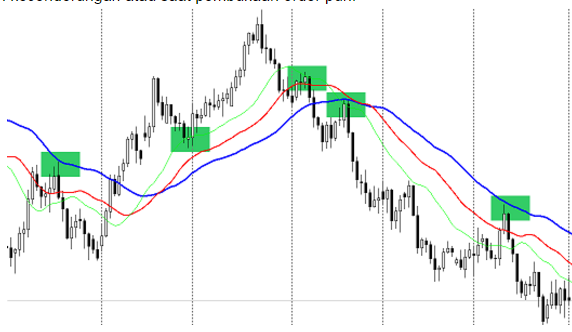 This indicator consists of three moves with various different parameters. And every moving number has a movement. For this reason, the Crocodile indicator consists of three medium or average lines called "Crocodile Jaws", "Crocodile Lips" and "Crocodile Teeth"
The main indicator signal is a meeting of price charts with all three lines. This shows the existence of a crisis in the market and changing movements. Then you should open a new directed transaction after the price has gone away from "teeth" and "lips" several times. 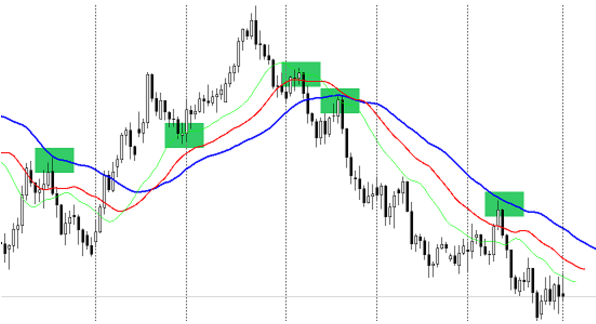 If the price exceeds both lines and away from the "jaw", the indicator will move further. The situation when the two lines meet can be considered as another signal. Even so, the basic interpretation is the analysis of the three average lines along the price chart. This example illustrates the indicator used with parameters 21, 13, 8. Actually this number is a Fibonacci number, but one more added. Everyone knows, most indicators give less signals, when the numbers are large, but at the same time the indicators filter out false signals. To explain this we can compare two images. The second image shows a signal that has more "clean" signals or is clearly not like the first example where standard parameters are used. Here it should be noted that various technical instruments have various ways of using them. Of course, there are pleasant characteristics of this indicator. This indicator can be used when there is a significant tendency movement. When there is lateral movement, the trader cannot work with the medium "Crocodile" line or avarage. In that case people say that crocodiles "fall asleep". And when the graph starts moving up or down, people say that the indicator is "awake". Thus, we can conclude that the Crocodile indicator, which consists of three averaging lines, might form an independent trading system. Of course, you can make the analysis process more complementary and use additional tools or instruments, but "Crocodiles" can be used without additional indicators, and that is a fact.